AILET (All India Law Entrance Test) is a national level entrance exam organized by the National Law University (NLU), Delhi. This exam is organized for providing admissions in UG & PG law courses B.A.LL.B.(Hons. ), LL.M, Ph.D. Programmes, PG Diploma) offered by the Delhi national law university and its affiliated institutions. The examination conducts once in a year in the 7th May 2017. The AILET application form is release from 3rd January 2017. 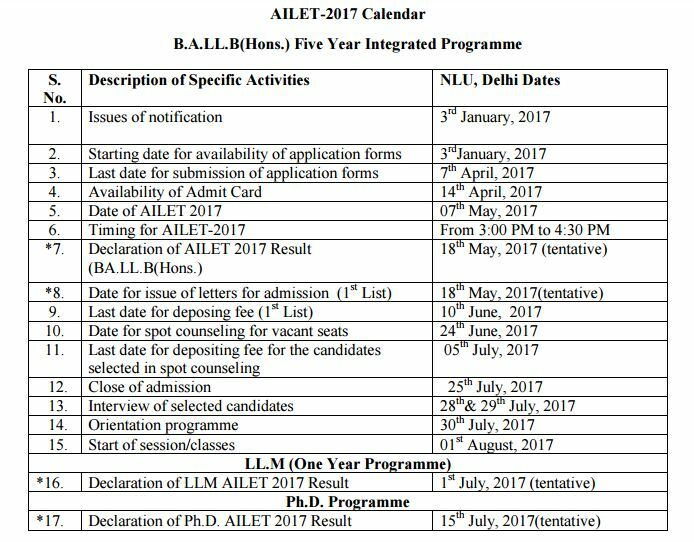 Through this article, candidates can check information related to AILET 2017 & NLU Delhi Admission including application form, exam pattern, syllabus, admit card, result, etc. AILET 2017 Application Form is available from the 3rd January 2017 and available till the 7th April 2017. The application form will be available via online mode only. Candidates can fill and submit their application form through the official website of NLU, Delhi through online mode. The application fee will be Rs. 3000/- (for general candidates) and Rs.1000/- (for SC/ST and Persons with Disability (PD) candidates). BPL candidates from SC/ST category are exempted from application fee. The fee payment will be done through offline mode (cash deposit at post office) and online mode (Credit Cards/Debit Cards and Net banking). There is no need to send the printed application confirmation page to the university. For B.A.LL.B. (Hons.) course, candidates must have passed 10+2 or equivalent examination with securing minimum 50% aggregate. The candidates must be below 20 years as on 1 July, 2017 (22 years in case of SC/ST category) for B.A.LL.B. (Hons.) programme. Foreign National Candidates have to secure minimum 65% marks in the qualifying examination for BA LLB course. For LL.M. (One year) programme, aspirants should have completed LL.B. or an Equivalent Law Degree with securing 55% marks (for general candidates) and 50% marks (for SC, ST or PwD candidates). For Ph.D programme, candidates must have a LL.M. Degree or equivalent with scoring minimum 55% marks for general candidates and 50% marks for SC/ST/PwD candidates. No. of Questions: The question paper will contain total 150 multiple choice questions. Exam Duration: The exam duration will be 1 hour 30 minutes. Marking Scheme: One mark will be awarded to the candidates for correct answer. There will be four optional answers will be given for each question. No. of Questions:There will be 100 objective type questions and 1 essay question. Duration of Exam: The exam duration will be around 90 minutes. Marking Scheme: One mark will be allotted in the objective type section for correct answer and essay section will contain 50 marks. Total Marks: The question paper will carry maximum 150 marks. No. of Papers: The entrance exam will comprise in two papers i.e. paper 1 (Research Methodology) and paper 2 (Research Proposal Specific Paper). No. of Questions: The paper 1 will comprise in 100 multiple choice questions. Exam Duration: Paper 1 time duration will be 1 hour 30 minutes. The paper 2 candidates have to submit a research proposal not more than 15 pages on the topic which candidates want to pursue a Ph.D.
Total Marks: Each paper shall carry a maximum of 100 marks. Old Question Papers of Entrance Test of B.A.LL.B.(Hons.) Programme from the year 2010 to 2016 are available on the counter at NLU, Delhi for sale on payment of Rs. 500 cash or by post by sending a Demand Draft of Rs. 550 in favour of Registrar, National Law University Delhi payable at New Delhi. AILET 2017 exam will be conducted at Ahmedabad (Gandhinagar), Amritsar, Bangalore, Bhopal, Chandigarh, Chennai, Cochin, Cuttack, Delhi, Guwahati, Hyderabad, Jabalpur, Jaipur, Jammu, Jodhpur, Kolkata, Lucknow, Mumbai, Patna, Raipur, and Varanasi. Click here to check AILET 2017 Breakup of seats. The AILET syllabus will be different for all the courses. For B.A., LL.B. (Hons.) course, questions will be asked from English, General Knowledge (Current Affairs, History, Geography, General Science, Economics and Civics), Legal Aptitude, Reasoning and Elementary Mathematics (Numerical Ability). For LL.M. programme, questions will come from these areas like Law of Contracts, Criminal Law, Law of Torts, Constitutional Law and Legal Theory. The AILET 2017 Admit Card will be released by the university in the 14th April 2017. Candidates can download the admit card through the official website of the university. The admit card will contain the examination details like candidates name & roll number, exam center, exam date & timing, etc. The question booklet and answer key will be uploaded on the official website. On the basis of marks scored in AILET exam, a merit list will be prepared separately for all the categories. Candidates who want to apply for copy of OMR sheet may send a DD of Rs.1000/- drawn on the favor of Registrar National Law University Delhi. Candidates who have participated in the AILET exam can check their result through the official website of the university. The AILET 2017 Result will be declared in the month of June, 2017. For BA LLB course, candidates have to secure at least 40% marks (30% marks in case of SC/ST category). AILET 2018 (All India Law Entrance Test) will be organized once in a year. It is organized by the National Law University, Delhi. Through this exam, candidates will get admission to the B.A., LL.B. (Hons. ), LL.M. and Ph.D professional courses. AILET Application Form 2018 will be released from the 1st week of January 2018. The admission in different courses will be based on the rank secured by the candidates in the merit list. AILET 2017 Counselling will begin after the result declaration. For Ph.D programme, candidates who have cleared UGC NET/JRF, SLET, and M.Phil. will be exempted for taking the admission test. For B.A.LL.B. (Hons.) course, admission in 70 seats will be done through AILET merit list and 10 seats will be reserved for direct admission to Foreign Nationals. For LLM course, 35 seats will be filled through AILET & 5 seats will be reserved for Foreign nationals. For admission in Ph.D programme, candidates have to clear the entrance exam after candidates have to make an oral presentation before the doctoral committee.